The Birmingham Orthopaedic Foot and Ankle Clinic has recently established at BMI hospitals, Birmingham by Mr H Prem treats patients of all age groups from newborns to the elderly. The aim is to provide the latest treatment modalities according to the NICE (National Institute of Clinical Excellence) guidelines. Three such procedures available at BMI are described below. Shockwave therapy is the most recent advancement in the treatment of recalcitrant Plantar fasciitis and Achilles tendinopathy. It's use in lithotripsy is well known. It is a non-invasive form of treatment avoiding painful injections. Most patients require 3 or 4 sessions of treatment. Radial shockwaves are delivered through a small hand held applicator held at the site of pain. This will be used as an adjunct to physiotherapy and orthotics. Basic science studies show that ESWT can enhance angiogenesis, stimulate growth factor induction and alter neuroreactivity. Success rate varies between 60% to 70%. 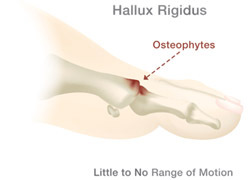 Arthritis in the Big toe -Hallux Rigidus- is treated with Metatarsophalangeal (MTP)joint injection for mild cases, Cheilectomy (excision of the bony prominence) for moderate cases and MTPJ Arthrodesis for severe cases. However the new procedure of surface replacement offers a solution for those who wish to retain mobility and avoid the pain from arthritis and impingement. Unlike most other MTPJ replacements there is very little bone resection and the normal anatomy of the plantar weight-bearing surface is preserved. It is ideal for those with advanced arthritis and a reasonable range of movement. Unlike silicone MTPJ prosthesis that is associated with radiological loosening the "HemiCAP" implant's titanium stem is built to integrate with bone like uncemented stems of hip and knee implants. While the majority of patients with mobile flatfeet do not need any intervention, there is a small group with significant symptoms who require insoles or surgery. Insoles are sufficient for mild to moderate deformities and the severe ones require extensive surgeries including osteotomies (cutting bone to reshape). Recently, a minimally invasive surgery, using newer models of sinus tarsi implants is being evaluated as per NICE guidelines in a selective group of patients. 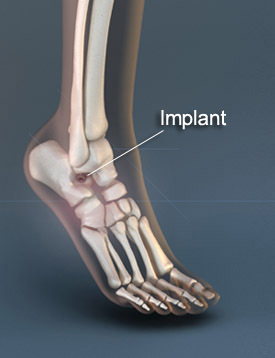 This implant provides a block to excessive tilt at the subtalar joint, keeping the heel in a neutral position and preventing it from collapsing along with the medial arch as seen in flatfeet. Some patients need Achilles lengthening.